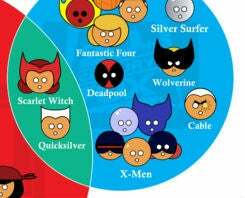 I was just getting caught up on the io9 main, and I noticed that on that chart for which movie studio owns which Marvel character, Cable and Deadpool are owned by the same studio. Can we please have a Cable and Deadpool movie, and can they please be boyfriends (or at least boyfriend-ish) in it as per canon? Okay, thanks. Queer superheroes FTW.